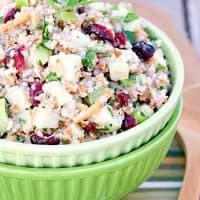 I was searching for some unique ways to use bulgur wheat (because I’d bought a whole bag with the intention of eating super healthy), when I came across a recipe for Bulgur Apple Salad with Cranberries and Almonds. Let me start by saying that my husband can’t stand bulgur wheat. He calls it vulgar wheat, so I really can’t overstate his dislike. Well, he liked this salad! He actually ate a whole bowl for lunch. So yeah, it’s pretty good! I adapted the original recipe somewhat to use what I had on hand, so feel free to do the same. Although I will say that Muenster cheese seemed absolutely perfect in this recipe, but Swiss or Monterrey Jack would be good too. And chopped dates or even dried apricots would be great in place of the cranberries. This does make a lot of salad, but I enjoyed it for lunch for 2-3 days. It would also be the perfect side for a picnic or backyard barbecue. Place the bulgur wheat into a bowl, and pour the hot water over it. Let it soak for 20 to 30 minutes, until tender. Drain off any excess water. 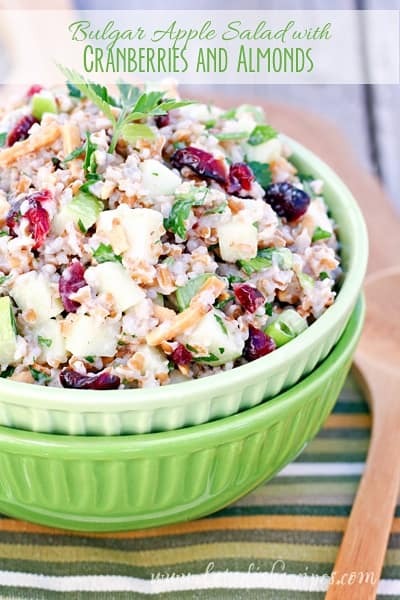 In a serving bowl, combine the apples, dried cranberries, green onion, cilantro and parsley with the bulgur. Whisk together the olive oil, lemon juice, yogurt, honey, salt and pepper in a small bowl; pour over the salad and stir to coat. Fold in the cheese and season with salt and pepper, to taste. Refrigerate until serving. Just before serving, stir in the slivered almonds.